The company expects normalcy returning to the business in the short to medium term with the predicted ease in cash flow in the broader economy. Consolidated PAT for the quarter, after adjustment for minority and share of profit/loss in associated entitiesstood at INR 170 million, an exceptional growth of 194% than the same quarter last year. The company's international facility at Cayman Islands reported revenue of US $8.4 million in Q3 of fiscal 2017,agrowth of 95% YoY over last year same quarter. 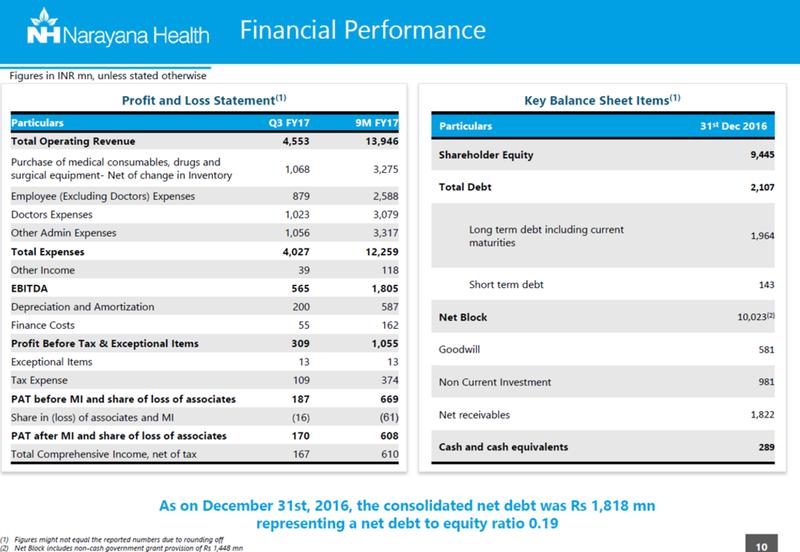 YTD is $ 23 million which is a growth of 133% for the year and EBITDA for the facility in this quarter is $ 800,000 which is an absolute movement of $ 2.4 million YoY. The unit broke even at the EBITDA level last quarter and the momentum is positive in this quarter as well. This unit caters to Caribbean, Latin American and North American population while being just located outside the US jurisdiction. Hospitals in less than 3 years bucket have contributed 11% of the revenues. These hospitals have a better ARPOB and occupancy compared to hospitals with maturity of 3-5 years. Yet the EBITDA margins are relatively less. Also, such hospitals have less complexity of work due to being at early stages and they also have high cost structures because of nature of facility i.e. more private room as compared to general wards and semi-private rooms at more mature hospitals. Company's over 5 years' bucket has ~24% EBITDA return at 60% occupancy whereas the 3-5 years' bucket and less than 3 years' bucket has relatively less EBITDA margin even at 51% and 55% occupancy. The company has always priced the services and procedures in such a way as to position themselves as the provider for masses and at the highest possible quality. Thus, 60% to 70% of the patients are in general ward category. 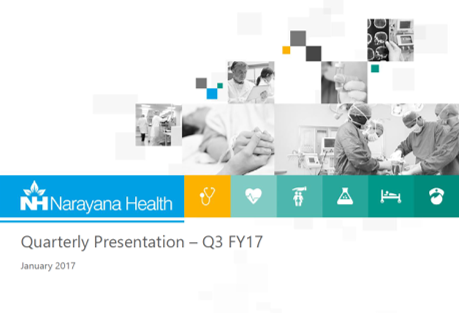 Narayana health typically operates in 3 to 4 price bands depending on the markets, local competition and other regional variations. The company benchmarks itself against the competitor local hospitals and prices at least 20% to 25% lower on the general ward category, whereas, in case of private room, luxury rooms, deluxe rooms, etc., prices are kept at par or competitive to some extent. Thus the price differential is lower for the higher categories at around 5% to 7% than the local competitors. The company expects prices, on an average, to increase by 5%-7% on year-on-year basis. 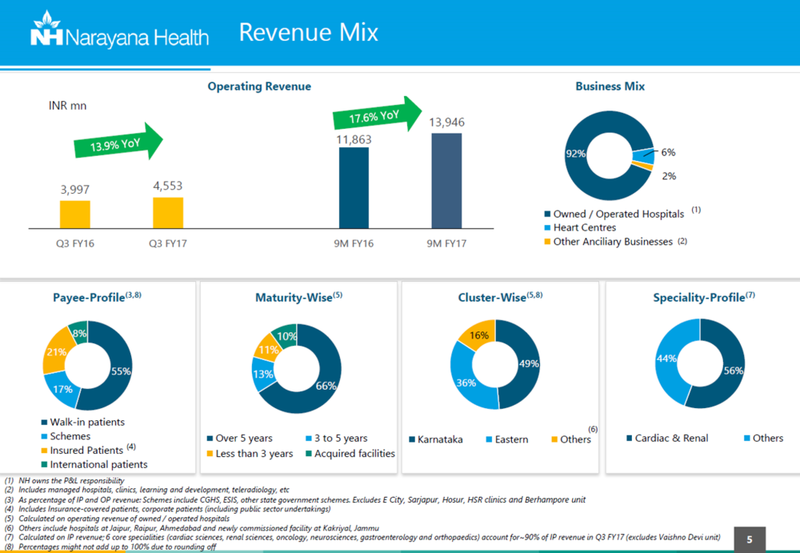 Narayana health's typical cost structure is such that ~23% are consumables and ~41% expenses are on doctors and employee benefits. Doctors' remuneration has fixed component of 60% and variable of 40%. The company's rental expenses and revenue share expenses as a percentage of revenue have come down to 2.5% YoY from 3% last year. It happened as the growth in revenues has far outpaced the growth in the rentals as not all the units are on a rental model or the revenue share model. Also, in some units, Company has bought out previously rented medical equipment thereby reducing the cost by 0.5% YoY. However, with newer hospitals and the revenue share model over there, the number may slightly go upward. The company's bucket of acquired hospitals has seen a lot of fluctuation due to 2 main reasons. First is the adverse impact of demonetization as these hospitals are at the outskirts of Kolkata metropolitan region and serve rural and semi-urban patient clientele. Second reason is the upgradation of these facilities like the installation of 2nd LINAC in the cancer hospital in Westbank. Its commissioning got slightly delayed but it is expected to be operational in next one month or so. In the near term, these 3 facilities are expected to grow at predictable pace. Another facility being added in this financial year is Children’s Hospital in Mumbai which is waiting for some final clearances and statutory approvals post which it will be commissioned. Company expects the hospital to get commissioned fully in the month of March 2017. The company is also evaluating 2 other projects- one is Kenya center of 130 beds and another is Bhubaneswar project of 220 beds. Both are in different stages. Planning for Kenya project is over, land has been acquired and construction is likely to begin soon. Company is in the process of finalizing the vendors. For Bhubaneswar project, there has been a delay because Company has requested the government to give them an alternate site. Company is waiting for the matter to resolve and thus project might happen in 4 years or so. As far as competition is concerned in acquiring the hospitals, competition is there but from acquisition point of view, company typically looks for standalone hospitals in good locations or a group of small 2-3 hospitals and they are not that competitive and thus competition is less there. The company aims to further leverage the capacities in the existing hospitals. The company's business model is such that fixed elements of costs are relatively much higher to variable costs as company mainly follows closed package system which contributes more than 50% of revenues. Similar is the way Doctor Engagement model operates with fixed costs much higher than variable. Thus, as the occupancy increases, the topline increase directly gets translated into profitability due to higher Operating leverage. Thus the company expects to achieve EBITDA margin above 20% in all the hospitals with increasing occupancy irrespective of the bucket. The company's total occupancy, on a consolidated level, is at around 50-57%. The company is targeting occupancy of 75%. The company has explicitly said that it would look for expansion within a unit or within a given geography only when the level of occupancy in hospitals stands at 70% on a regular basis.However, company does not look at occupancy on a consolidated basis but on a per hospital basis. With newer hospitals being added, company expects the consolidated occupancy to remain almost same for the near future.